Some of the world’s most magnanimous natural attractions and recreational leisures are at our doorstep. The lodge is the ideal sanctuary for touring in and around the Island Park area. The proximity of Yellowstone National Park is certainly one of the allures to which Island Park bravados. 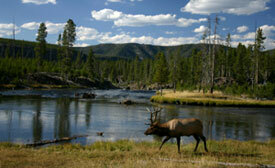 A mere 35 minute drive from the lodge, the Park is a wonderful place to spend the day. Guests will relish the impressive array of Park wildlife, including: buffalo, elk, deer, Bald Eagles, wolves, bears, and many other animals. Enjoying the dramatic scenery, scouting the hot springs, geysers, and other fantastical geological features is a wonderful way to spend time while in the Island Park area. 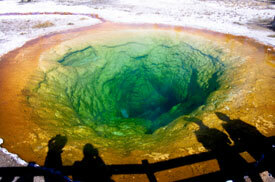 Serving as the headquarters to the Snake River, Big Springs is the site from which the famous river begins. An incredible one hundred and twenty-million gallons of pure water surge from the natural spring each day. The water here runs a year-round temperature of 52 degrees, Fahrenheit, creating the optimal river habitats that anglers so famously enjoy. The trout at Big Springs get BIG, but leave your fishing rods at home, as fishing is prohibited until below the outlet to Henry’s Lake, several miles away. However, guests can toss fish food, available at the vending machine, to the monster trout, from a beautiful bridge and watch them rise to eat! Both the Upper and Lower Mesa Falls are the two last major falls in Idaho that have not been used for irrigation or hydroelectric purposes. 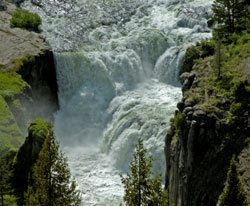 Two spectacular waterfalls on the Henry’s Fork of the Snake River, each falling at 110 feet and 85 feet, respectively. Each of these magnificent falls are a breathtaking must-see. Both of the falls can be viewed in full, and guests can enjoy the Upper Falls with a short hike on paved paths and from accommodating viewing areas, during the summer months. The falls are also a historic sight for snowmobile enthusiasts to behold, as the trails are conveniently groomed to both Upper and Lower Mesa Falls, throughout the winter months. The former Railroad Ranch was owned by Union Pacific Railroad investors from 1902 to 1977. The property then served as a cattle ranch and private retreat to the Harriman and Guggenheim families. Today, Harriman State Park, lies within a 16,000 acre wildlife refuge. World-renowned for its waters, eight miles of the Henry’s Fork River snakes its way through the park, playing host to and challenging anglers from around the world. There are also over 20 miles of trails available for hiking, biking, horseback riding, and cross-country skiing. During the summer months, guest can even enjoy a guided tour through the old Railroad Ranch buildings. A short walking trail from the bridge at Big Springs takes guests to the Johnny Sack cabin. Earning its place on the National Register of Historic Places, the cabin is a museum worth visiting. The German immigrant, John Sack, built his cozy cabin and its furnishings, by hand, out of the local and nearby trees. Ingeniously enough, he also built a water wheel, turned by the springs, which provided him with electricity and brought water uphill to his cabin. Copyright © 2017, Pond's Lodge. All Rights Reserved.